In 1857 the antiquarian and prodigious benefactor Sir Augustus Wollaston Franks lighted on a small, odd-looking whalebone box in an antique shop in Paris. 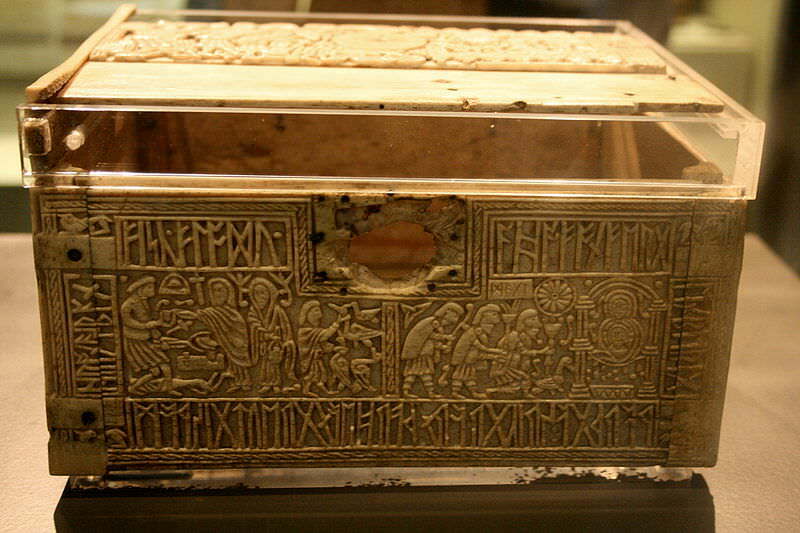 He purchased it immediately, having recognized that the box was of Anglo-Saxon origin, and donated it to the British Museum some years later; it would come to be known as “the Franks Casket” in his honor. It was immediately recognized as a very singular piece, and one of singular importance (not merely to Anglo-Saxon studies). The unknown medieval artist who wrought the Franks Casket carved it intricately with scenes from myth and legend originating in different traditions — Roman, Germanic, and Christian — but perhaps quite at home in a culture as composite as that of Anglo-Saxon England. Framing these panel-pictures, or within them, are inscriptions that alternate between Latin and runic Anglo-Saxon, and it has been (rightly) taken for granted that they explain or describe the artwork in some way. In general, however, too much has been taken for granted with respect to the casket over the past 150 years,and while scholars have made some important steps toward its understanding, ill attention has generally been paid the crucial details of the artwork, while linguistic problems with certain of the casket’s captions have kept us from reading what may be among the oldest lines of English poetry. The Franks Casket thus remains one of the oldest and greatest outstanding puzzles in Anglo-Saxon studies, indeed of medieval studies, and as it lies at the intersection of history, linguistics, poetry and art, there are many who should like to see it “deciphered.” I first learned of the casket in January 2009, published a preliminary essay in July, and gave a talk at the University of Texas in autumn that same year. The form of the essay presented here is current as it was first published and distributed in late January 2010. I have attempted to engage the Franks Casket as a whole, every side, each inscription, presenting my own vision of the casket’s meanings, while attempting to vindicate it as a nuanced, authentic work of art.